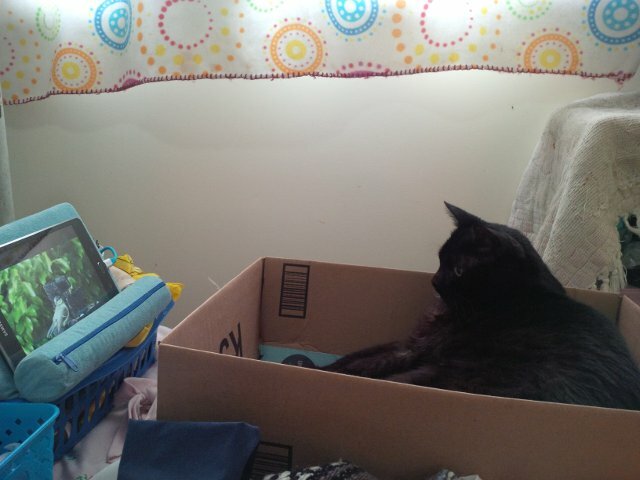 Jackie sent me, mostly as a joke, a link she’d come across to a YouTube video for cats. Mostly as a joke, I tried it, while I was in front of my laptop and Cory was sitting on my lap, just after getting one of his measured hand-fed kibble meals. Freya watches at moments but prefers beating up physical toys or getting loves. Trick watches more often, but he always does so from a short way off and at an angle or from behind something. Maybe he likes to feel as though he’s stalking them? Hi Steph, reporting Cory’s blood test results. Good news is that although his Lymphocyte, Eosinophil and Monocyte counts are still all elevated, they are stable. At this point I really think the changes we are seeing are related to his allergy/skin disease issues and may be something we will always see on his blood work. Whether the oil will help with this, who knows? I think we can continue with medication and supplements as planned, and see if we can slowly wean down his buprenorphine. Call me if you have any further questions, but good news overall. Not cancer. Still some odd autoimmune stuff, still some undefined neurological stuff that he is working through beautifully, but… NOT CANCER!!!! We’ve been working on getting his buprenorphine shots down as rapidly as we can while still watching for any trace of pain. Having started at 0.08ml twice a day, we’re now down to 0.04ml in the morning, and he had 0.02ml last night which will be the last evening shot he gets. I’ll bump tomorrow morning up to 0.05ml, just in case to make sure he’s not dropping too fast, but then we’ll go back to 0.04ml. I think we’ll keep him at that level for 2-3 days, then start reducing it again. Within a week or so, I think we can have him off it entirely, assuming we see no signs of pain! Otherwise, he’s his happy cheerful loving self, and he’s been extremely inquisitive. 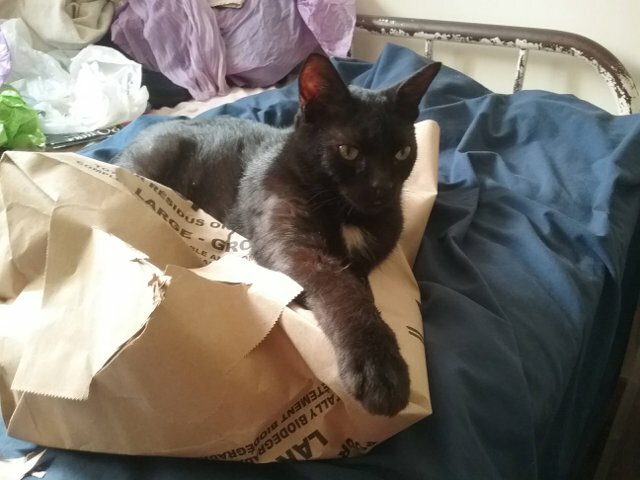 We put down big leaf/garden waste bags for them now and then, it’s just heavy brown paper and they love it. I always cut an X in the bottom end so no one can get cornered in it – they’ll rip it the rest of the way if they need to. I also gave Cory a smaller one meant as a bin liner for organic waste, on my bed. I’m not allowed to remove the one from my bed entirely. The other cats are not allowed to use it. They are allowed to use the big one near the balcony door. This bag are belong to me. All the usual! When Jackie had a shower, he hung around in the window inside the shower with her for a while, after only a very brief drink – guess he was enjoying the peripheral spray, the company, something fascinating outside the window, or some combo! Cory had a vet visit late in the morning. He was amazingly calm about the whole thing. Normally, like most cats, he gets rather stressed, although as long as I’m there it’s usually manageable. We had an ice pack in a towel in his carrier because it’s so hot, and brought his brush since that’s recently even more of a big thing for him than usual. He was fine being brushed while the tech (or assistant?) got his weight and took his temperature. While we were waiting, he explored the room, purred some while cheekrubbing the corner of the cupboard and me, got brushed more, relaxed under Jackie’s chair, burrowed in his carrier blankets a bit (normal for him – I think he thinks he’s a wombat sometimes), and generally wasn’t all that upset. 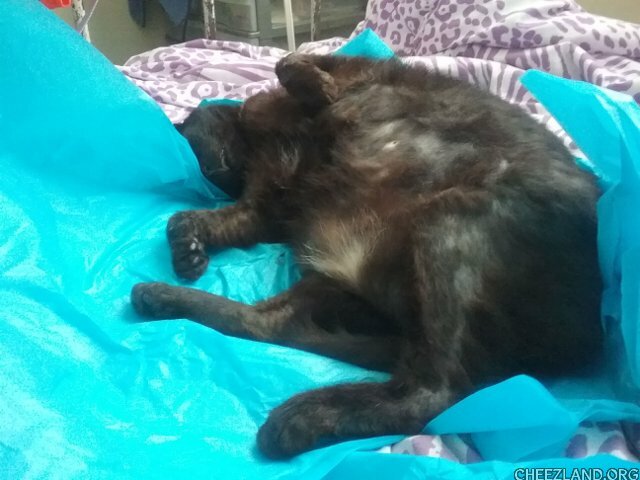 I took a nylon shopping bag out that I had in my purse, and held it for him, and he thought about it briefly and then dove into it, turned around, and settled down. Which is where he was when the vet came in! He was great about being examined, moved casually from my arms into those of the tech who came to take him to the back, and apparently very cooperative about getting a bit of blood taken for a complete blood panel. 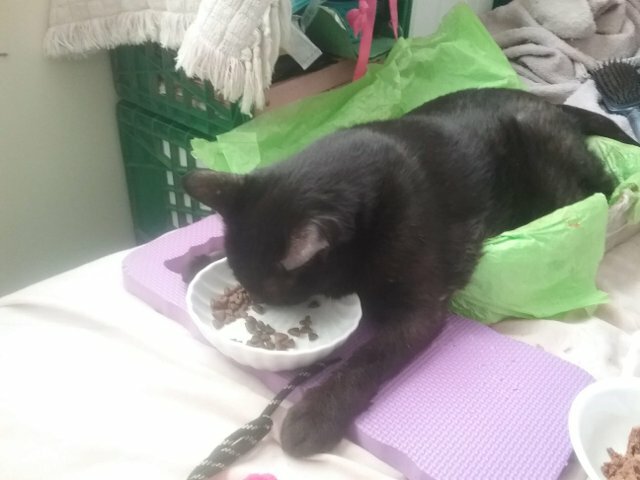 His weight is up, which is a little disappointing but better than wasting away, and given how much he’s enjoying being able to feed himself again, it isn’t much surprise. That odd lower lip is apparently another allergy/autoimmune thing, normally it would take putting him back on prednisolone to get rid of it but the oils in his CBD oil may help. Otherwise, he’s doing great, his tooth pain is nicely under control and she agreed with our plan to keep edging the buprenorphine gently down while watching for any signs of pain. While Jackie paid and got us a cab, he lounged in his carrier getting brushed. When we got home, I ran briefly upstairs to put a delivery notice on a neighbour’s door so they wouldn’t miss it, and Jackie said he tried to follow me, which is pretty adventurous for him! So now we wait until Wednesday for results of his bloodwork to see what his white blood cells are doing, which will give us a better picture of whether there’s really cancer involved. At this point, I’m sending this file to the vet, although I intend to continue it as well. I know, no posts for a couple of days… because there was nothing to say! Because we have a bunch of pics and a bit of video from the vet on Monday, that’ll be up as a separate post right after this one. Nothing new to report. He’s doing just fine on 6 units (0.06cc) of buprenorphine twice a day, with a 7kg dose of CBD in salmon oil in the morning along with 5mg of Reactine, and FortiFlora in the evening. No apparent pain, he’s eating and drinking comfortably. He’s curious, alert, with nothing suggesting stress or anxiety. He cycles through his various beds over the course of the day like always. He solicits attention and reciprocates enthusiastically, but without any impression of being needy or insecure or seeking comfort – including going after my ponytail vigourously. He made an impressive leap from the shower windowsill into my arms, over my shoulder and into Jackie’s. In general, he’s just… himself. 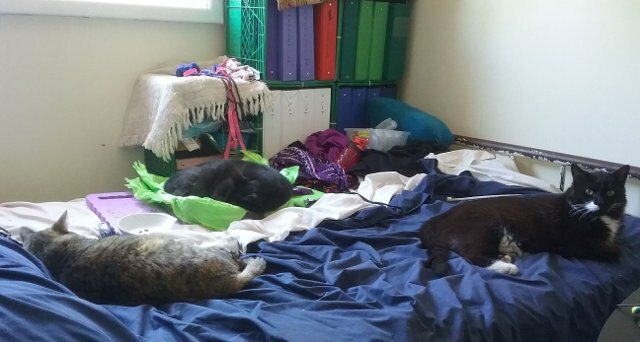 I do need to note that all three have had a couple of good firm normal bowel movements, so as long as the FortiFlora continues a bit longer, I think the whole viral diarrhea episode is done. They haven’t had any pumpkin for a few days. Sorry, no pics – I was really tired after a broken and short night’s sleep (partly feline-induced, but only partly). He had a good, if ordinary day, doing all his usual stuff. Really nothing special to note. He was doing so well that we decided we could get away with dropping his buprenorphine down to 6 units (0.06cc), a further tiny jump, for his evening dose. From 8 down to 6, in both cases twice a day, is a pretty substantial reduction in less than a week, with zero negative effects, and I’m really happy with that! We aren’t going to be in a hurry to bring it down further, however. Pushing too fast is going to be counterproductive. A 25% reduction is enough for right now. Between his evening shot and beditme (which was at least 5 hours later) I saw no reason to think that it’s too much too fast, he was eating and drinking comfortably. The viral diarrhea may not be 100% gone, or maybe the virus is but it did some harm to gut bacteria. I dropped Trick and Freya to half the FortiFlora probiotics a few days ago, and that was apparently okay (they were splitting two packs a day between them, so each got one full one over the course of the day… it dropped to splitting one per day across 2 meals). However, when I stopped altogether, I found messy stuff in the litter box. Cory doesn’t like the stuff at all, but a few days ago I started mixing it into his evening wet food syringe, just to get it into him, and the last of his diarrhea seems to have cleared up within 24 hours. So we skipped the pumpkin for this evening, to see if that makes any difference. None of them like it, and I don’t like stressing them out, even though I will if I must for their own safety. So far, evidence suggests that probiotics are more significant than fibre right now. I’ll ask the vet for more on Monday, I don’t think that will be a problem. When the morning alarm went off, he joined Jackie in the bathroom, purring, and wanted some quick headbonks. By the time I got there, he wanted up into the window. I couldn’t stay with him and simultaneously get everyone’s breakfast and meds and pumpkin supplement together, so Jackie came back to stay with him. He did eventually want a drink (he turns around and looks pointedly at the showerhead) but not a large one. A bird flying by while he was drinking prompted him to whip around 180 degrees and crouch, watching everything – not a fear reaction, a hunting reaction, and once he established that it was gone, he resumed his small drink and wanted down. On my bed, which is kitty central, Freya tried to wash his face and ears, but he was determined to wrestle instead. 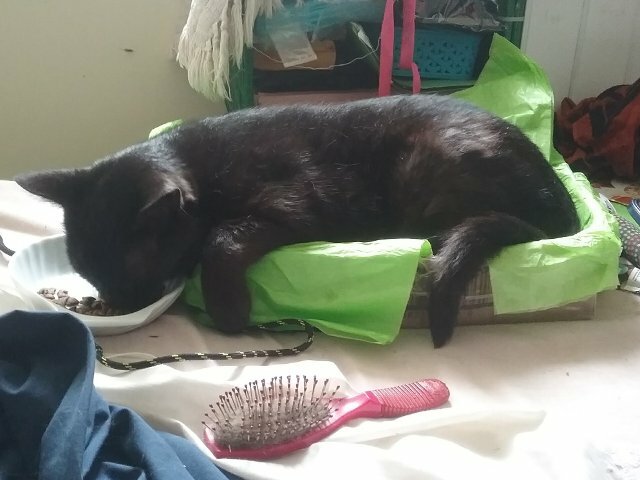 She gave up and went to the food, finishing off the last few kibbles from last night, and Cory went to a different kitty bed. He had no interest in the food, until Jackie opened a new serving. (We have small containers on hand with a limited amount, so it can’t get nasty in the current hot humid weather, and also so we can track roughly who’s eating how much.) As soon as the new food hit the dish, he was immediately interested, and between them they pretty much finished 3 tbs of mixed kibble. We started Cory on CBD oil on Monday morning. Dosing is a minor problem. It comes with a built-in dropper and says 1 dropper is 1ml, which is the appropriate dose for a 5kg pet. The dropper has no markings to indicate what level exactly is “full”. The salmon oil base makes it too thick to work well in a 1cc syringe. We’ll work on this. This bottle is 75mg/100ml of CBD in salmon oil, lower concentration than the variety at Pet Valu, which is the pet store I’m in several times a month anyway so that’s incredibly convenient, but it’ll suffice to see if/how it works. Starting off treating him at a 5kg level, which gives us room to increase a bit and also to make sure he tolerates it. So, yeah. I’m going to stop apologizing for how irregular this blog is. I’ll post when life and my own brain allow, let’s leave it at that. But I’m going to try to do regular-ish posts for at least a week or two, because we’re trying something new. Cory-Bear is starting CBD oil. If you don’t know what that is, it’s one of the two main compounds in cannabis – not the THC that gets you all buzzed and gives you the munchies. CBD acts primarily as an anti-inflammatory. Since some folks not familiar with the story so far might find this, I’m going to do a post now explaining the background situation, and then I’ll do one about the results of the first couple of days. Are you surprised that Cory demanded water at 5:30 am? If you’ve read the past few posts, you shouldn’t be! I passed back out after the water without offering food, which may have annoyed him. At least, when the alarm went off and I dragged myself out of bed and took him to Jackie, he promptly bolted. I retrieved him, and he had his meds, but refused to let her feed him. Less than half an hour later, he was in my room demanding food. He polished off his entire breakfast, and then an hour later, ate almost two full snacks. 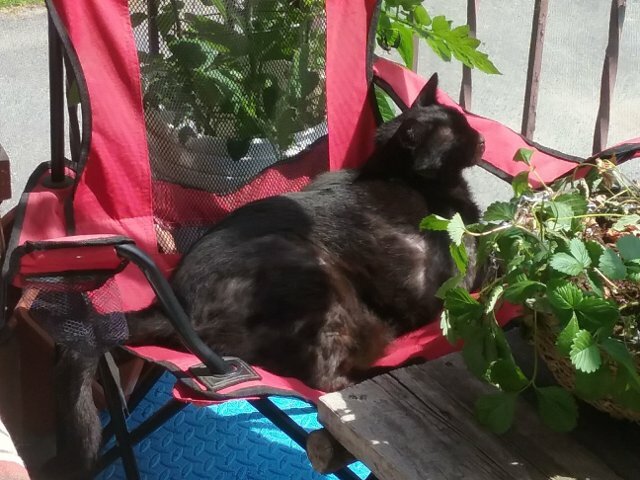 Meanwhile, there was lots of cuteness involving Freya in a sunbeam wanting loves, and Trick wandering around dragging random strings (shoelaces and such) while hollering about how no one notices him. At least it wasn’t worms from Jackie’s balcony garden this time (if they’re still alive – she’s had a lot of bad pain lately and care of the garden’s been a little ragged, which some plants are handling better than others). He’s decided since that he only likes turkey crunchies, not the other flavours, and they have to come from me, not Jackie. But she is allowed to give him water and loves.